Scroll down to check out this year's exciting set of workshops on sustainable gardening and gardening design. Have you attended one of our workshops? Please click here to share your feedback. Click here to learn more about other learning opportunities at Abbondanza. Saturday, May 13th. 10 a.m.-3p.m. 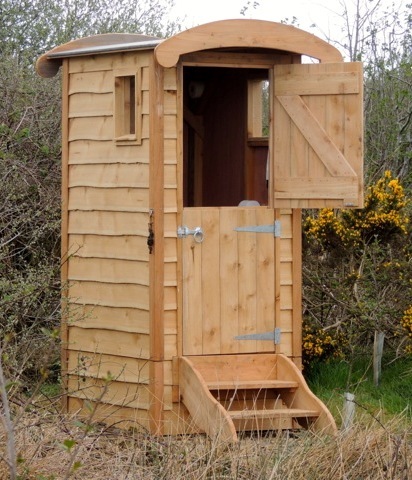 Outdoor compost toilets are a terrific sustainable alternative to the conventional outhouse. They are simple to build, safe and easy to use, very environmentally friendly, and the best solution when water and sewers are not available. Compost toilets have been successfully used for years around the world and here in Quebec where they are gaining in popularity and regulatory acceptance. By the end of the day you’ll have all the information you need to build and successfully manage your own outdoor compost toilet. Cost: $75, be our guest to a complimentary garden lunch. Sunday, August 21st. 10 a.m.-3 p.m. Yes, you can build your own beautiful stone walls and structures! In this hands-on workshop, expert wall builder Doug Ernst will take you through the basics of design, selecting and handling rocks, essential tools and materials. The workshop will culminate with Doug guiding the group in building a new stone wall. Doug's magnificent farm is the site for this workshop where you will be able to see finished walls and structures of all shapes and sizes, as well as projects in various stages of development. Creating gardens that look good enough to eat! Sunday, August 28th. 10 a.m.-1 p.m.
Can there be any greater delight than cooking with produce fresh from your garden? The pleasure is doubled when that garden is a feast for the eyes! Combining food crops and ornamentals has along history, for a good reason--all that diversity results in gardens that are beautiful AND productive! This workshop will focus on how to create gardens consisting of edible and ornamental plants. All the techniques we’ll examine can be applied to any garden space, from a city front yard or balcony to an ample country lot. "I am so grateful for the lovely day that you and Doug offered us on Saturday. It was rich and beautiful and full. I came home feeling deeply nourished and satisfied. Thank you so much." "Thanks for a great workshop, Gwynne. I loved your property and your whole approach to Edible Landscaping. I was really inspired and happy to learn so much about where to buy seeds and fertilizing!" Sunday, September 18th. 10 a.m.-3 p.m.
Have you always wanted to save seeds from your favorite garden vegetables and flowers but weren’t quite sure how to do it? Well it’s easier than you think! In this workshop you will learn everything you need to get started saving and storing your own seeds. And, you will find out why seed saving is not only a fun, practical addition to your gardening activity but can also make an important contribution towards preserving our precious agriculture heritage. Abbondanza's many gardens are filled with a tremendous diversity of plants that will provide excellent examples of how to save your very own garden seeds. The workshop will be led by Lyne Bellemare, Communications Coordinator for Seeds of Diversity Canada. Lyne is an experienced trainer in both seed saving and permaculture design. Cost: $60, be our guest to a complimentary garden lunch. Have you attended an Abbondanza workshop? We'd love to have your feedback about your experience! Click here to write us a message.